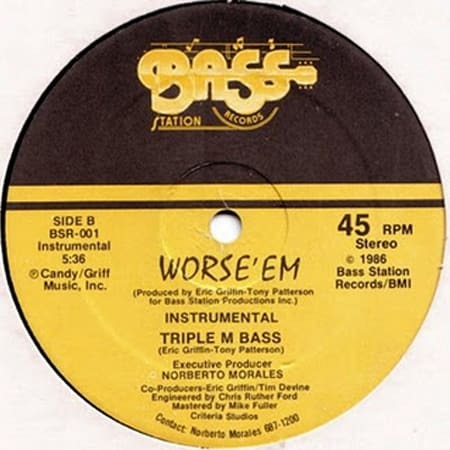 An outgrowth of the Triple M DJs, the Worse 'Em Crew—a mobile DJ unit behind the Bass Station nightclub and record label—were on their way to becoming a formidable force in Bass when leader Norberto "Candyman" Morales was killed in 1987. Their "Triple M Bass" theme (also featuring Young & Restless mastermind Alex "P-Man" Ferguson) was the handiwork of Eric "E.G." Griffin (a.k.a. Speakerhead), a St. Louis native responsible for some of Miami bass's most innovative and challenging records. The first Bass producer to employ an SP1200 drum sampler (on Dynamix II's "Just Give the DJ a Break"), Griffin also pioneered the use of tonal bass. As with Morales, Griffin—killed in his studio by a rap group he was recording—and Ferguson—a record store owner turned journalist who penned the Hip-Hop Weekly article outing Rick Ross as a former correctional officer—both met violent ends, making Worse 'Em's story among the darkest in a music scene riddled with tragedies.